1. Open pack of Delight™ and remove approximately one half pack, seal rest in a Zip Lock bag. 2. Rub wad of Delight™ onto Stream Bottle and Aquamarine ink pads to color. Work color through with your hands to marble. 3. Roll onto piece of wax paper. 4. 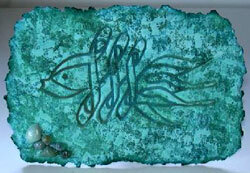 Ink Fish Stamp with Bottle, Stream and Aquamarine inks in a striped pattern. Press into Delight™. 5. Ink background stamp with Bottle, Stream and Aquamarine alternating colors, randomly stamp over entire piece. 6. Tear edges and let dry overnight. 7. Cut easel back to fit Delight™ piece, making sure piece sits level. Spray front of easel back with spray adhesive and attach to back of Delight™ piece. 8. Super Glue sea shells along bottom.